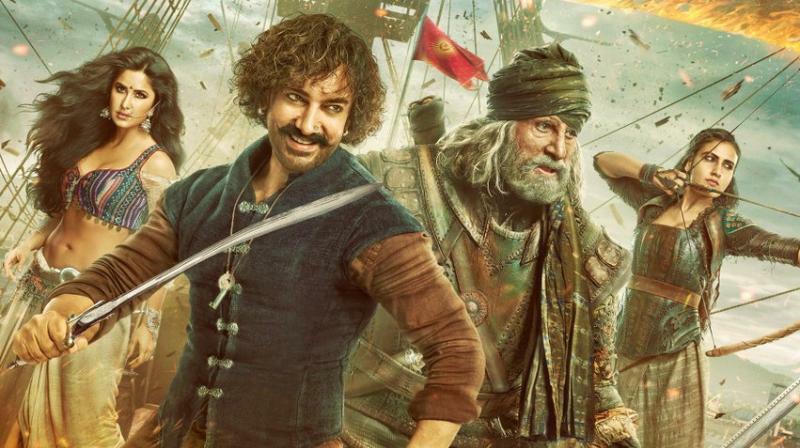 Thugs of Hindostan Casts Amitabh Bachchan, Aamir Khan , Katrina Kaif, Fatima Sana Shaikh and Lloyd Owen in lead roles. The film follows the group of thugs where fearless Khudabaksh Azaad(Amithab Bachan) is a commander of Thugs, Zafira(Fatima Sana Shaikh) is also one of the thugs in the group who is well versed in warrior-archer. These Thugs aims to make Hindostan free from the expanding British East India Company rule. British government appoints some officers to suppress Thugs. To battle him and his gang, British commander John Clive(Lloyd Owen ) decides to send Firangi Mallah, a small-time Thug from Awadh. Suraiyya(Katrina) in the role of dance performer. How things unfold forms the rest of the story. Based on the novel 'Confessions of the Thug' Vijay Krishna Acharya has made this film. Action scenes are impressive in the first half. The twist before the second half is good. But in the second half, a few scenes are logicless. Music, background music, CGI work, and the whole sets are impressive. Production values are rich according to Yash Raj productions. Amithab and Amir impressed the viewers with their characters. Katrina Kaif attracted the audience with her beauty and dance steps too. Fatima Sana Shaikh in the role of Zafira got a meaty role. Amir Khan as Firangi Malla has the most shades to his character. Amir and Amithab together make steps in one song it is one of the beautiful moment in the film.